Last week I broke down and did something that I had been meaning to do for months and months. It was the final step to moving back into my sewing room from my temporary (ahem, since the fall) sewing set up in our formal dining room. I recovered my office mini ironing board cover. I bought it from Ikea years ago. I love that the tiny legs fold up and and you can hang it up for storage. But, over time it became flat, and ripped and stained beyond recognition. It was so flat, it would leave grid marks on my fabric. I took the old cover off and pulled out the strings that gave it that 'curved around the board' effect. I was going to re-use them, but apparently melted them while trying to iron the cover flat. Once I had ironed out (ha!) the cover into a flat surface, it was my pattern piece. I cut out my new cover using this, as well as one layer of fusible fleece, one layer of batting and one layer of old white fabric that I would never actually quilt with. I fused the fleece to the white fabric and tested both this layer and the batting on for size. They needed a bit of trimming but would work fine. To prepare the cover, I used cream extra wide double fold bias tape and just eased it around the fabric, sewing it down on the inner edge of the tape. I was worried about sewing the tape on the curves and started to pin, but in the end, I found it easier to just slowly feed the tape around the fabric as I was sewing. When I got back to where I started, I clipped the tape, I folded in the end of the tape and stitched it down. This left a sort of tube effect for feeding the string. For "string", since I had absolutely nothing appropriate, and had melted the one provided, I used 1/4" elastic, which turned out perfect. Once fed through, I layered my board. Against the metal was the initial padding from the store (I'm all for re-using), the layer of quilt batting (also a scrap), then the fusible fleece/fabric combo, fabric side up, then , then the cover. Once in place, I had one of my kids hold one end of the elastic while I pulled the other end (really, really tight) and tied a bow around the hangy bit on the underside. All told, this took maybe 45 minutes. The extra padding makes this board a dream use and the sunny yellow dots add just the perfect amount of fun (and a whole lot of happy) to my new/old sewing space. This is my finish to link with finish it up Friday. 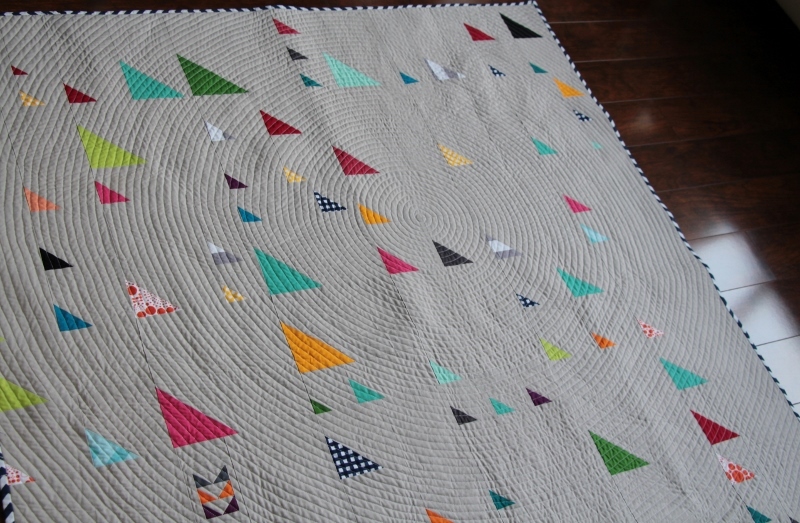 So, today's quilt didn't even have a chance at becoming a UFO. This was one of the fastest moving projects I've made, simply because I just didn't want to stop till it was done. It was that fun to make. I quilted it with a single, off-set spiral. I was really inspired by Amanda Jeans tutorial on spiral quilting. I just love the effect it gives. 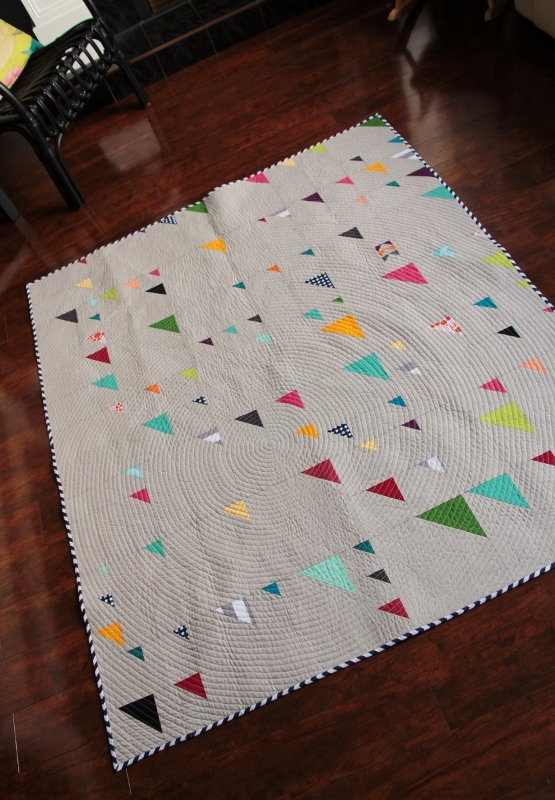 It's so modern, and fresh, and adds a kind of movement to a quilt top. I had designed my quilt with this in mind. The backing I chose was a largish golden yellow polka dot, also a basic by Riley Blake. I cannot tell you how much I LOVE this backing. It's just so happy. For the binding, I used a Riley Blake navy and white chevron, which picked up the navy in the gingham triangles. 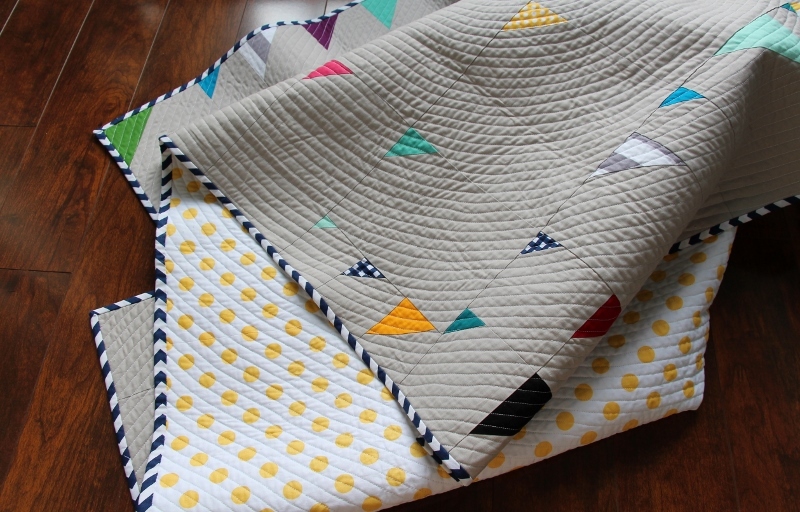 As I mentioned in my last post about this quilt, this was my first time participating in a fabric challenge with the MQG. This past Monday, at our VMQG meeting, I was able to show this quilt and the hexagon quilt to our guild. Needless to say, as it was my first time participating in a show and tell, I was terrified. Thankfully I made it through. I imagine this part of things will get easier. Wednesday, I found out that my quilt was chosen as one of 10 entries, out of 390, to be finalists in the challenge. Seriously, I was floored. I could not believe it. Of the 10 entries chosen, 3 will be chosen in the next week for prizes. Simply making it into the top 10, when there were so many amazing entries was such an honor. Really. I am giving the quilt to my little munchkin this week. He's gonna love it. I can only hope he feels the happy that was sewn in with every stitch. I was torn on whether to share this quilt in its quilt top state. 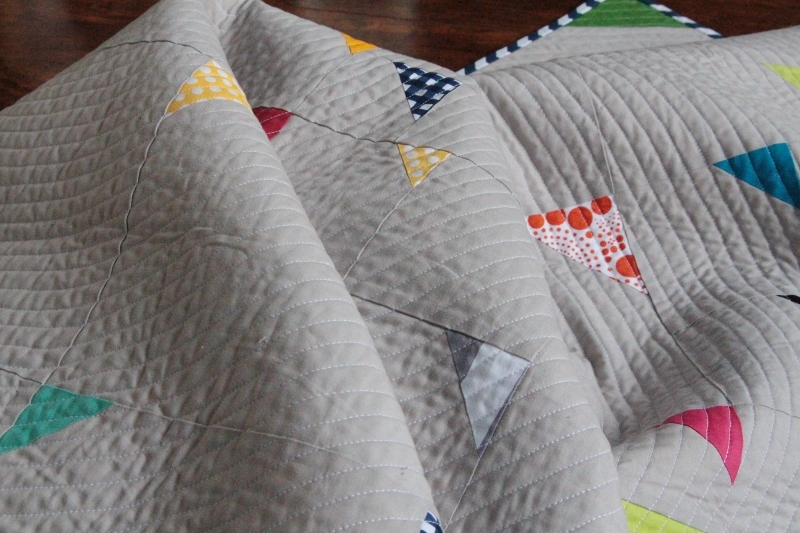 It has been such a fun, fun quilt to make, that I've barely put it down to take pictures. But I've decided to go for it. I'm a relatively new member of the VMQG. One of the first challenge projects that I've had a chance to participate in is the Basics Challenge with Riley Blake Designs. I was so excited when I picked up my fabrics at last months meeting. I had absolutely no idea what to make so I laid them out on my sewing desk, and while working on other things, I let the ideas percolate. Then I went to the drawing board. I toyed with doing something using a pattern from a designer, but in the end, decided to be brave and design something myself. This is a win win project. This is my challenge entry and it will also be my baby's first "big boy quilt". It's a bit early to make him one, but he really is a big boy, and the baby quilts I made him when he was tiny are so easily kicked off and more often than not, he sleeps uncovered in his crib. 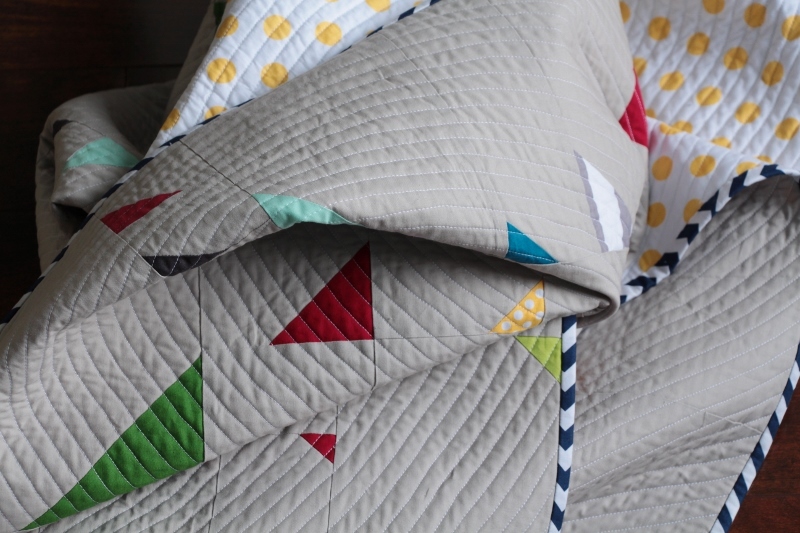 I wanted to make this quilt "un-kickable". It took a day or two to hash out a plan and do the math, in between all the other things moms do. I decided to throw in a tiny little accent. I fiddled with some flying geese blocks and made this tiny little sequence. I love it. It measures around 2 inches by 1 inch, per unit. The background fabric is a Moda Bella grey that I love and just might have bought a bolt of... The bits of color are solid scraps from my collection. After some sewing and trimming and pressing, there was a quilt top. I apologize for the quality of photos. I didn't stop to take proper pictures during this process (just Ipad pics). I didn't expect it to move so quickly. The finished top has so many things I love about it. I love the color and the motion, and how the bits of the challenge fabrics play so well with everyone else. When laying out the backing and trying to determine my piecing plan, my little guy found his quilt. And boy was he pleased with it. It was a swirly, wrinkly mess in 30 seconds flat. He LOVED it. And it wasn't even done. One more nap for him and it was basted. 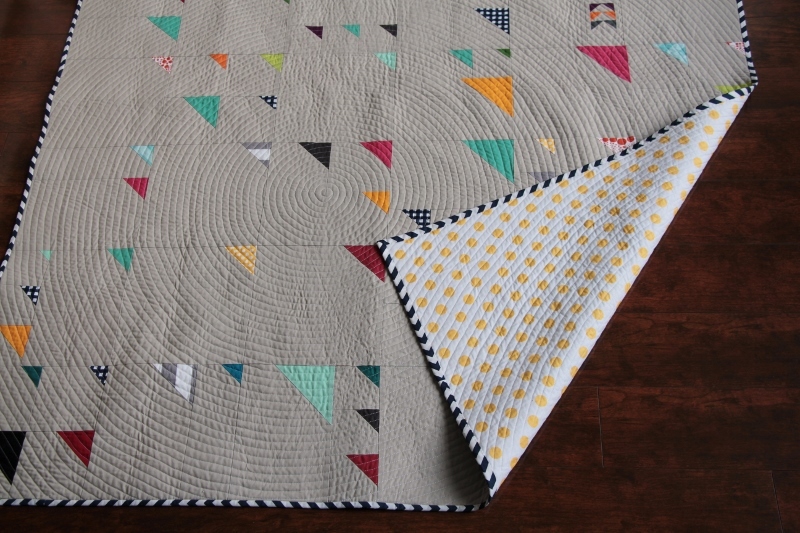 This just might be my favorite quilt ever. At least until the next favorite one.